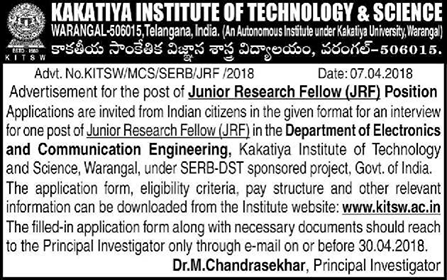 Kakatiya Institute of Technology and Science, Warangal has advertised in THE HINDU newspaper for the recruitment of Junior Research Fellow jobs vacancies. Interested and eligible job aspirants are requested to apply with in 30th April 2018. Check out further more details below. About College: The institution was started functioning in 1980 with two B.Tech programs (viz., Civil Engineering & Mechanical Engineering) in sprawling lush green campus of 65 acres, in the area well connected by rail (Kazipet & Warangal) and road. It is a self-financing co-education institution affiliated to the Kakatiya University (KU), Warangal and is the first private engineering college in the Telangana region. The institute also has the distinction of being the first institute in the country to offer a B.Tech program in Electronics & Instrumentation Engineering since 1981.